This is my second Archer. My first Archer fit reasonably well, but this one fits a lot better. I made a few extra changes to better accommodate my broad shoulders. This consisted of lengthening the shoulder seams by 1/2 inch and spreading the back by 5/8 inch (without changing the neck width). However, next time I think I’ll shorten the shoulder seams back again by about 3-5mm on each side. The armscye sits a little wide in this version. I might consider adding fish-eye darts to the back if I decide I want to change it to a more streamlined fit. Right now I’m happy with the relaxed look. This is probably how I’ll wear the shirt in Fall. I most likely won’t be wearing it with the collar stand buttoned, but the fact that I can (and still move my arms) is nothing short of a miracle. Well, it would be if we were talking about RTW. Another great thing about sewing for yourself is the fact that you can position the buttons pretty much anywhere you want. I have no idea what the actual pattern recommends. I focus on the third button down and position that in relation to my body. The rest of the buttonholes are measured equally apart from there with this neat tool. 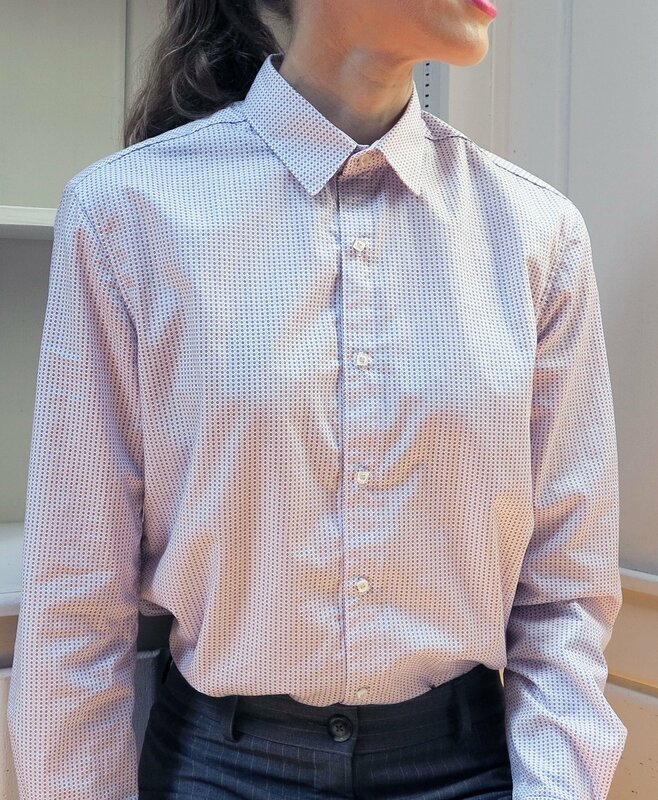 The third button down is generally the top button I keep buttoned so I want it to be at a modest height but not too high either. My favourite thing about the Archer is the collar. It has such a lovely shape. My least favourite thing about the design is the sleeve placket. A sleeve placket is very easy to change though. I used a very standard sleeve placket pattern piece, pilfered from my husband’s TNT shirt pattern, Simplicity 6138. I used white cotton as a contrast for the sleeve plackets, inside collar stand and yoke facing. The grey wool trousers belong to a Herringbone Sydney suit that I’ve owned for ten years. The original shape was a long, boot cut. However, they’ve never quite been long enough on me and the boot cut style is now quite outdated. Oh dear, look at the not-so-blind stitching on the left hem. I machine blind-stitched the hems and will have to re-do the left leg. I knew I’d left the tension too high on that leg but was hoping those puckers would iron out. The following diagram helps to describe my modifications. I narrowed the side seams and re-hemmed the legs. I tried to keep a deep hem in case I want to lengthen them again in the future. 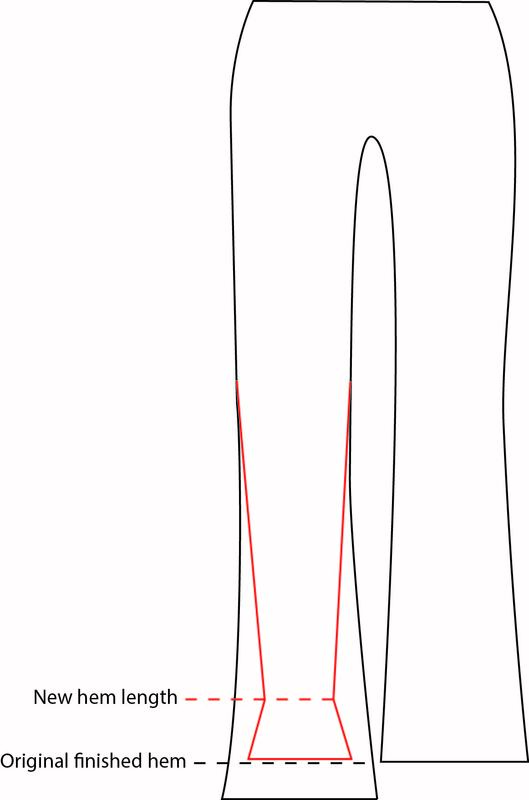 The picture below shows the shape of my modified seamline (red). My main concern with these pants was in getting the leg length and width correct, particularly towards the calf and ankle. I wanted them to be narrow and tapered but not too tight around my calf. I’m quite happy with the shape I achieved. 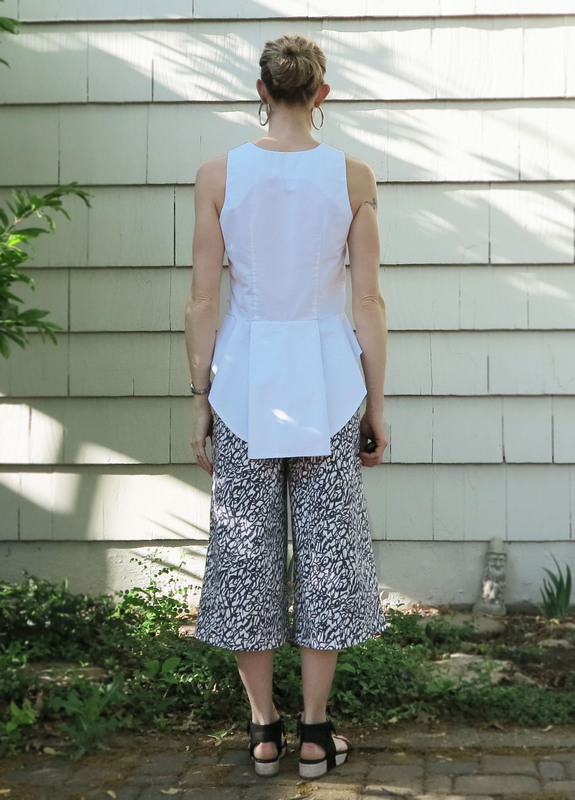 I have another pair of trousers planned, but next time I will sew them from scratch in black cotton sateen. I’m working on the pattern right now. It’s nearly drafted, but I want to mull over the pocket design first. I like to sleep on a design before I cut into the actual fabric. More often than not, I’ll wake up with the idea I couldn’t quite grasp the night before. 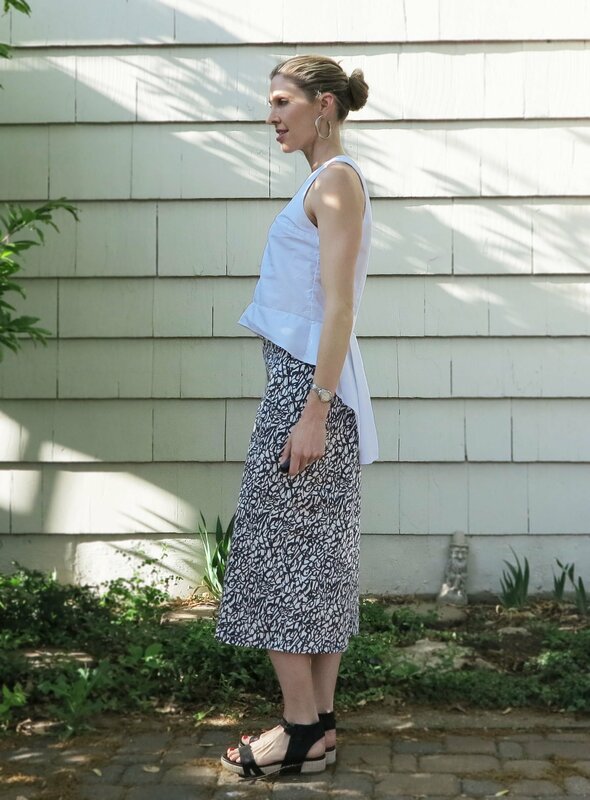 This entry was posted in cotton, pants, Tessuti Fabrics, top, Uncategorized, wool and tagged Archer, cropped, Grainline patterns, leather, shirt, shirting, Tessuti Fabrics, trousers on September 17, 2015 by Debbie Iles. I’ve had this gorgeous fabric languishing in my stash for nearly two years. 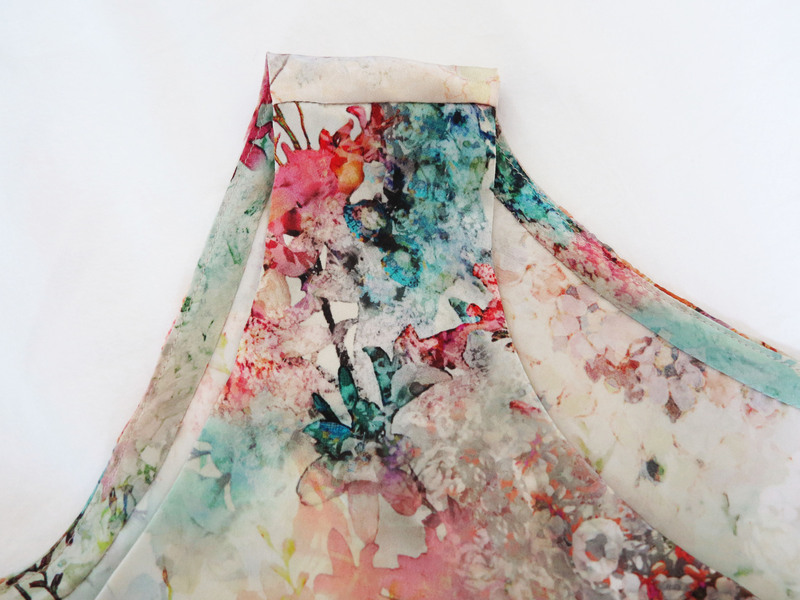 I don’t use a lot of floral and I rarely have the occasion to justify sewing with silk charmeuse. Even so, this one stopped me in my tracks and I had to have at least a little bit of it. I went home with a little over 1m. In retrospect, I wish I’d purchased more. It would have been the perfect silk to use for my bias cut dress. I was just waiting for the right idea to come along. I should thank from Melanie from Poppykettle and Rachel from Boo Dog and Me for inspiring me with their beautiful Frocktail tops. In particular, I liked the idea of pairing such a delicate floral print with leather. The design is a loosely fitted shell top with straight side seams and bust darts for a little shape. I hand-stitched the binding and hem down. I felt like this fabric deserved it. I also tried to achieve a length that would suit wearing it out loose or tucked in. I’m very happy with how it worked out, but next time I will raise the armscye by smidgen (about 1/4 inch). I love the way this fabric pairs with leather. 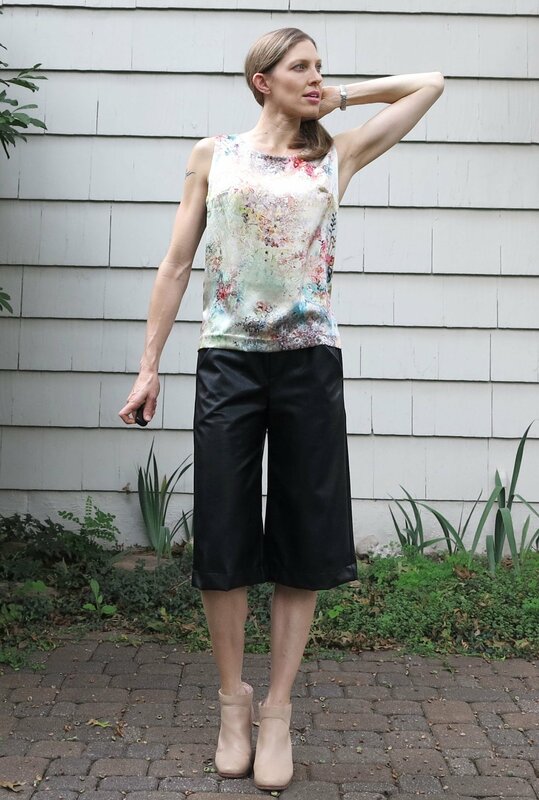 These shorts were a bit of a rush make compared to the other leather pants I’ve made (here and here), and the leather is more faux than real, but I’ve always recognised them for being the trend-piece that they are. I’m not going to love this style forever, but I have been getting a lot of wear out of them this season. No, I don’t wear them on the school pick up, but when paired with a nice top, I find them to be the perfect blend of smart and casual for outdoor parties and BBQ’s. 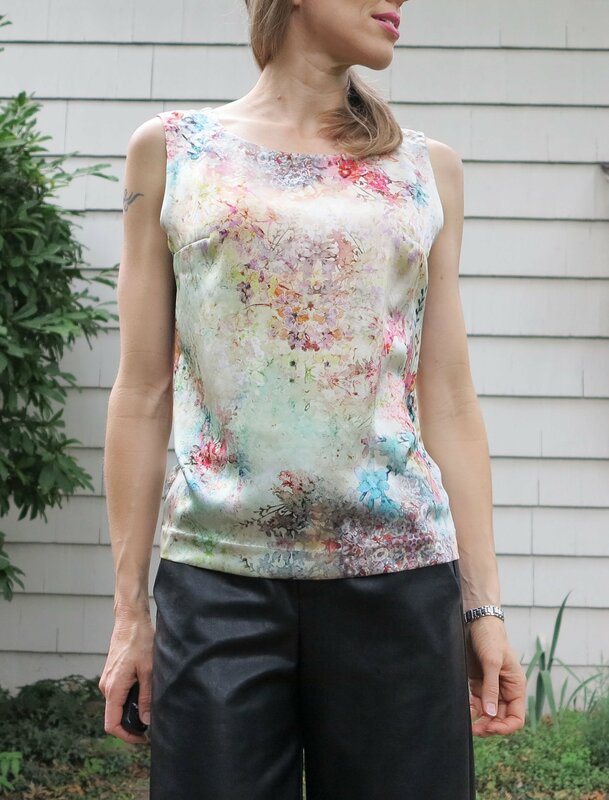 This entry was posted in faux leather, gaucho, leather, pants, satin, shorts, silk, Tessuti Fabrics, top and tagged charmeuse, cropped, culottes, faux leather, floral, gaucho, leather, pants, satin, shell, shorts, silk, sleeveless, tank, Tessuti Fabrics, top on August 24, 2015 by Debbie Iles. This is the BEST fabric ever! It’s a stretch cotton in a nice medium weight, which makes it perfect for shorts, pants (and playsuits of course). Quite simply, those squiggles make me smile. I wish I had enough left for a long A-line skirt now. 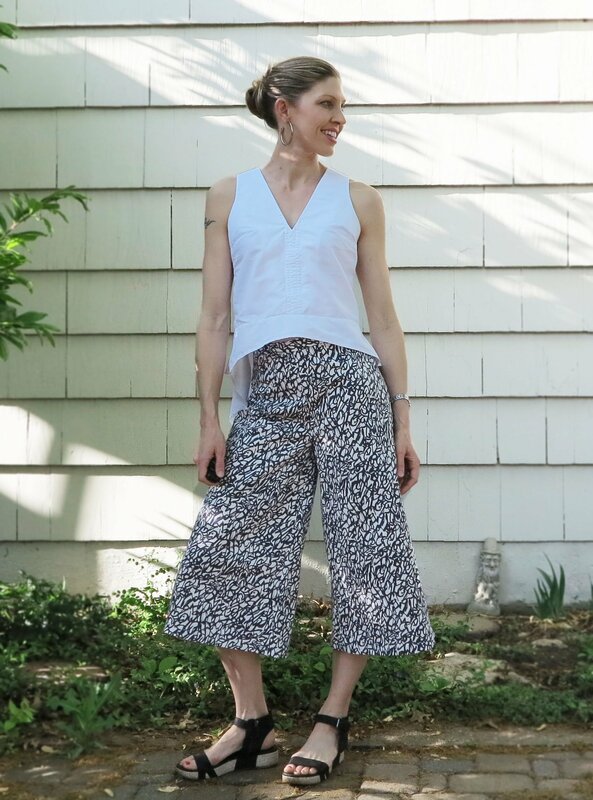 This time, I made some cropped pants of the wide leg variety. They hit high on the waist so I think I can safely call them gaucho pants. The white top is an oldie but a goodie. I wore it A LOT last Summer and I predict it will be getting more of the same love this year. 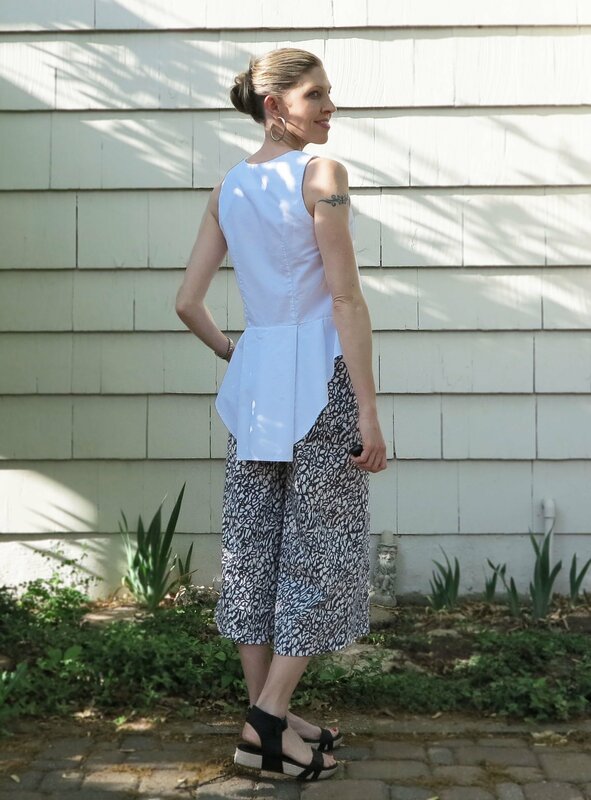 This entry was posted in cotton, fabric, pants, shorts, Tessuti Fabrics, white and tagged cotton, cropped, gaucho, pants, peplum, sateen, shorts, squiggles, Tessuti Fabrics, top, white on May 6, 2015 by Debbie Iles.